Rome, the 23rd May 2017 – UNINETTUNO, wholly successfully assessed by ANVUR. According to the National Agency for the Evaluation of the University and Research System, the International Telematic University UNINETTUNO proved to be among the best three Italian Universities, both private and public ones, and the only one, among the online universities, to be awarded a “Btel-fully satisfactory” judgment. 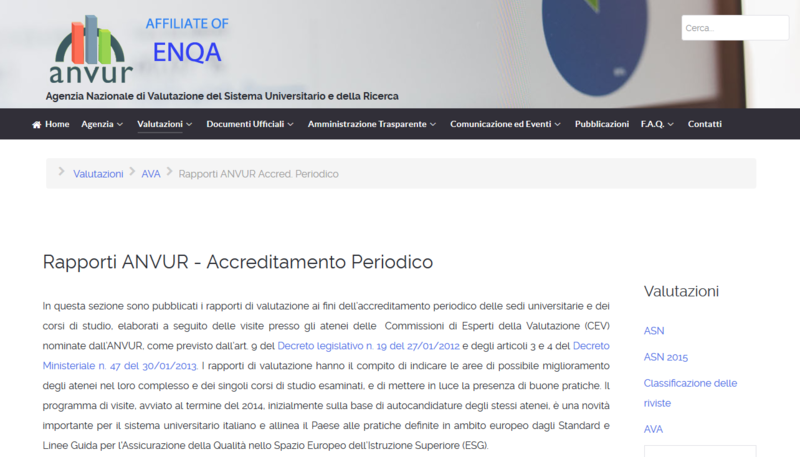 ANVUR’s accurate assessment, which is carried out on a regular basis and is compulsory to get accredited by the Ministry of Education, has, therefore, stressed again the excellence of an educational and organizational model that is unparalleled in Italy (the other online Universities were awarded a “D-conditioned” judgment). University courses in five languages (Italian, English, French, Arabic and Greek), six faculties, twenty-five degree courses and over 163 exams centers across the world, UNINETTUNO is not new to public acknowledgements, even within the international scientific community. Actually, it dates back to 2010, the E-xcellence quality label assigned to it by the EADTU (European Association of Distance Teaching Universities) for the best e-learning model and to just three years ago that of the International E-learning Award awarded to it by the IELA (International E-Learning Association, based in New York). “The distinctive feature of our University – the Rector, Prof. Maria Amata Garito, remarks – is given by a psycho-pedagogic model that is unparalleled in Italy and across the world and on which our Internet-based learning environment relies and which is the outcome of over 25 years of research work. I am very proud to take credit for a model that allowed us to reach thousands of students of over 163 countries of the world and which makes of us a truly Global University”. The strong points, certified by ANVUR: contents reliability, efficient organization and responsiveness towards the students, teachers’ quality, strong vocation to internationalization. “Precisely in this direction – Garito concludes – the implementation, in our portal, of the first University for Refugees (www.istruzionesenzaconfini.it)in the world goes which allows refugees and immigrants to make their qualifications be recognized and complete their studies. In addition, we decided to offer 50 scholarships since we strongly believe that knowledge can be an extraordinary instrument of peace”. Click here to see ANVUR’s evaluations.